Chrome, a domestic bag and clothing manufacturer located in the South of Market district of San Francisco, has pushed the limits of design with indestructible messenger bags and bike related clothing for the past 12 years. Chrome has returned to the technical clothing arena with its launch of a line of bike related clothing with a raw urban edge. The designs bring a style other wise left out of the bicycle market or lacking when related to urban technical clothes. This new line of urban riding clothing will consist of a 3/4-length messenger style knicker called Shins, and a front zip Merino Wool Jersey called Pacer. 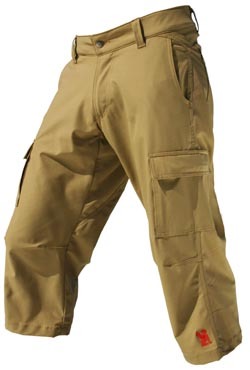 Features include the use of breathable and water-repellent 4-way stretch fabric, lightweight 3.8 oz material, articulated knees and zipper secured cargo pockets. The Shins also include a lightly padded seat and inseam, secure pockets, and are cut high in back and low in front for superior comfort and feel. Chrome will feature the full line of products at Booth # 377. All of Chromes clothing is made in San Francisco, CA with a lifetime guarantee. Chrome's products are available nationwide at select retailers as well as online at www.chromebags.com. For more information, please visit the Web site or email chrome@chromebags.com or call 415-503-1221.